About a month ago, in the gallery of the Cultural Center of Ulcinj was established the theater "Teuta". Theater "Teuta" will be released this weekend with the first show in Albanian titled "NANA", this show will be on the stage for two nights. The first appearance in the Albanian language in the neighboring state of Montenegro will be on March 16 and 17 (Thursday and Friday) at 20:00. Actors who will perform in this show are: Vjosa Tasholli, Muho Uruçi, Anes Kurti, Kurti Albana Zecevic and Alaj Union. Author of this play is Arlinda Morina with director Munib Abbas and assistant directing Mustafic Edina. Set design and costume will be by Jetmira Hoxha, with music by Ardian Hasanaga and lighting powered by Musa Hoxha. 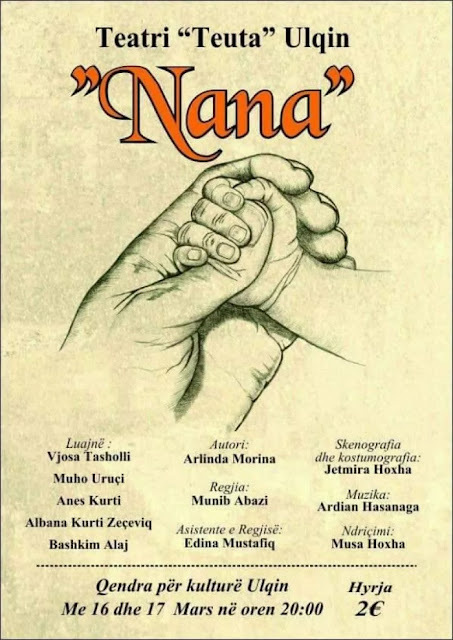 The first project of this theater, "NANA" is expected to convey many emotions to foreign and domestic audience that will be present. At the first press conference of theater the actors of "Teuta" stated that the primary purpose is the revival the theatrical and cultural life of the city. Within the theater will work a staff consisting of professional directors, set designers and Costume designers and graduate actors, who for the domestic and foreign public will bring national and international showcase of different genres.